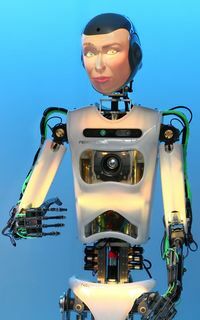 RoboThespian™ model RT4 is a life size, interactive, fully programmable humanoid robot exhibit suitable for public display, demonstration and academic research. 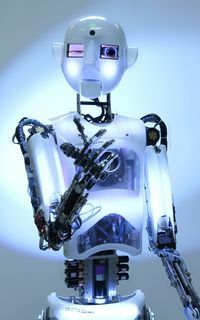 The robot features an actuated upper body, arms, fingers, head and jaw designed to mimic human expression and gestures. All models share most of the same RoboThespian functionality and features, but there are key differences in the head and hand design. Version specific information can be found under separate subheadings. 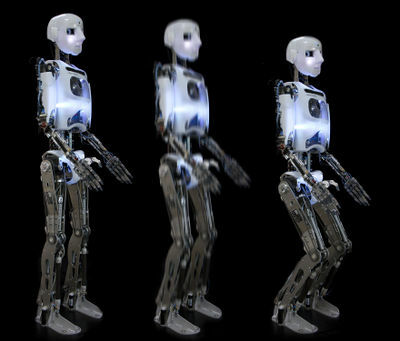 Unless otherwise noted, the guides in this wiki are applicable to all RoboThespian versions. In the head 2 LCD screens bring the robots eyes to life, RGB LEDs capable of any colour bring colour to RoboThespian's cheeks, while a high speed servo synchronises mouth movements with speech. Custom electronics control and synchronise these features. The fingers can be independently opened and closed, ideal for forming most gestures, pointing, counting on fingers etc. It is intended for public display, demonstration and academic research. 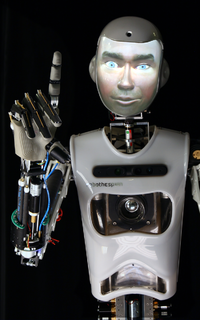 A different head design containing a pico projector projects the entire face of the robot. Using our InYaFace software the face can take on any form, is animated in real time to show any expression, you can even create your own guises (faces). InYaFace runs on the robot and is accessed in your browser - no installation required. Read more about the projected face and InYaFace here. It is intended for public display, demonstration and academic research. The Projected Face allows creation and facial mimicking of different people and characters. 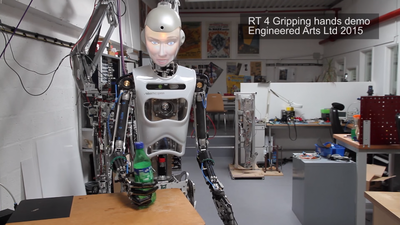 The standard model RoboThespian's arms are designed for fluid motion and lifelike gesturing. If you want to be able to grasp objects with the same fluid motion we can offer hands with adaptive grip. The under articulated finger design accommodates a wide range of objects and large soft rubber surfaces allow the hands to grip heavy objects with minimal pressure. It is intended primarily for academic research, where manipulation of objects is required, but can of course be used in public display if desired. Click on the image below or click here to watch a short demo. A customer specific variant, incorporating a further axis of movement enabling RoboThespian to bend at the knees. The legs are actuated using a pair of air muscles. Please note that feet remain secured to the base. A barrier to prevent contact between visitors and RoboThespian. Just received your RoboThespian? - Start with the Quickstart guide. The Troubleshooting pages give information on resolving issues with RoboThespian. It is for RoboThespian customers who are experiencing an issue and want to find a solution any time, day or night, as quickly as possible. Step by step instructions with photos aim to step you through the process. 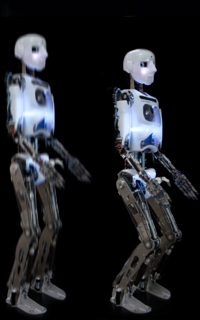 A complete list of RoboThespian pages are here.